Auburn University's student-entrepreneurs now have a place to call home. 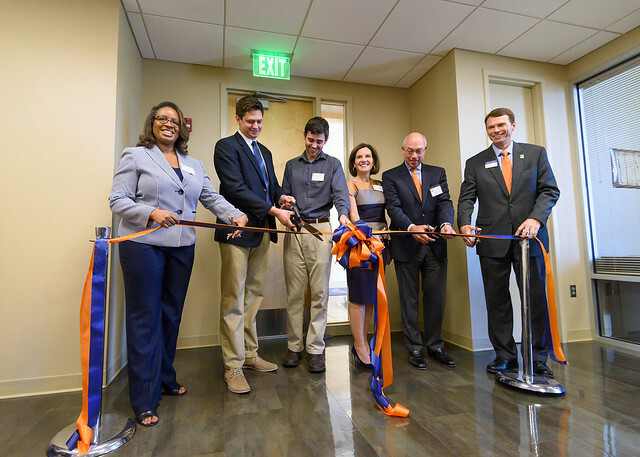 The Tiger Cage Accelerator and Incubator, which officially opened with a ceremonial ribbon cutting on Friday, Oct. 6, at the Auburn Research Park, provides student-led startups with valuable resources like office and meeting space, as well as access to mentors. "Instead of us saying, 'Hey, we're working out of this garage or apartment,' we have a legit business at this great facility," said Jackson Speaks, a sophomore finance major in the Raymond J. Harbert College of Business, who co-founded Funnel, a mobile app that consolidates friends' social media networks. "To have this space and get the team here is unbelievable. Instead of me texting my partner or our employees saying, 'Let's get this done,' we can meet here and we can figure out what's going on and work together. To actually have an office, it lets us take pride in what we do and what Auburn has to offer." The 2,700-square-foot Tiger Cage Accelerator and Incubator is a collaborative effort between the Harbert College of Business' Lowder Center for Family Business and Entrepreneurship and the Auburn University Research and Technology Foundation. It is located within the Auburn Research Park at 570 Devall Drive, Suite 103. "What we wanted to do was provide an open, collaborative environment for all Auburn students to work on their business ideas and provide some structure for our student entrepreneurs," said LaKami Baker, managing director of the Lowder Center for Family Business and Entrepreneurship. "By providing formal space for the students, we help them legitimize their business while providing some guidance so they can advance through the different stages of the entrepreneurship process." Chris Maurice, a senior in finance at the Harbert College of Business who co-founded digital currency exchange business Yellow Card Financial with computer science student Justin Poiroux, believes Auburn is bringing entrepreneurship "to the forefront." "I think over the next few years we'll see a lot more people coming to Auburn for entrepreneurship rather than the people already here being inspired," said Maurice, whose team won $25,000 at last April's eFest national business competition in Minneapolis, Minnesota, and was recently named a semifinalist in the seed stage of the 2017 Alabama Launchpad. The semifinals will be Oct. 16, with three entries advancing to the finals of Nov. 15 in Birmingham. The Alabama Launchpad's "seed" winner will earn $150,000. "It's just a matter of time before we're on the forefront of schools here in the United States that you come to because you know that you can make yourself successful and you know that you can do something big on the world stage," Maurice said. "As we continue to promote entrepreneurship around the world, we'll bring in more talent and continue to grow. Maybe we'll have the next [Mark] Zuckerberg." The Tiger Cage Accelerator and Incubator celebrated its official ribbon cutting on Friday, Oct. 6. Pictured, from left, are LaKami Baker, director of the Lowder Center for Family Business and Entrepreneurship; students Justin Poiroux and Chris Maurice, co-owners of Yellow Card Financial, a digital currency exchange business; Lynn and Benny LaRussa, CEO of Sterling Capital Management; and Harbert College of Business Dean and Wells Fargo Professor Bill Hardgrave. Gibson Wang, left, and Berk Anadur, right, operate SoleLine Shoes, which created a device that serves as a storage unit for footwear. They are utilizing the new Tiger Cage Accelerator and Incubator at Auburn University. Auburn University's Harbert College of Business provides its students with an innovative-yet-practical education focused on career readiness. The college's degree programs in accountancy, business analytics and supply chain management lead the nation. Its research centers in supply chain management and radio frequency identification (RFID) technology guide the Fortune 100. Harbert's pioneering online education programs offer value and flexibility. The college's nationally recognized faculty produce research that informs and responds to today's business trends. Learn more at the Harbert College of Business website.